NAGURU – The Ministry of Health is hunting for two cholera patients who escaped from the isolation centre at Naguru Hospital on Tuesday. On Monday, the ministry confirmed that two of the eight patients admitted to the hospital from Kabowa village in Lubaga division, Kampala, had tested positive of the deadly disease. But on Tuesday, the duo is said to have escaped from the hospital under unclear circumstances. 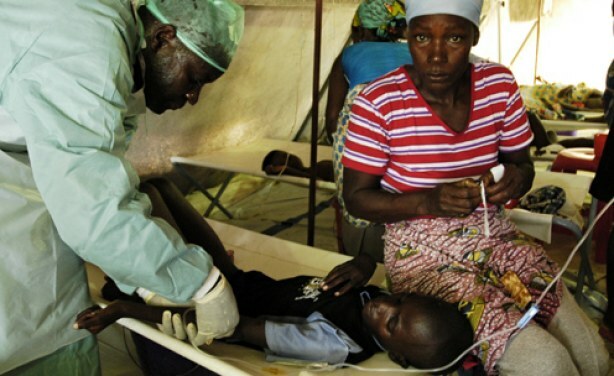 According to Mr Emmanuel Ainebyoona, the Ministry of Health senior public relations officer, the patients are at risk of death as well as infecting others. “The executive director (Naguru Hospital) told me the patients ran away from the hospital, and they (the hospital) they are looking for them. These patients should not complain in case of anything,” Mr Ainebyoona said. Residents of the area said the patients decided to leave the hospital after the management asked them to buy medicine yet they could not afford. However, Mr Ainebyoona denied the claims of the hospital charging patient’s fees. “All medication is available at the hospital and actually some of the patients are being handled by the director of the hospital himself. Those are just rumours,” he said. Meanwhile, Kampala Capital City Authority (KCCA) has banned food vending in the area and announced plans to clean up the drainage system in the area. Mr Balaam Mubbala, the health inspector KCCA, blamed the residents for constructing toilets near the drainage system as well as dumping all sorts of the dirt in the drainage system. “Tenants are registered, and all local leaders should be in position to check out all those without toilets. Beginning today we are doing an operation, the toilets near the drainage we shall not allow because it is increasing on the problem,” Mr Mubbala said. The residents, in turn, blamed KCCA for taking long to collect the garbage and charging high amounts for the garbage. “Each person is charged Shs3000 per week for the garbage. This forces some of the residents to sleep with the garbage in the house, some use it as mattresses yet others dump in drainage system or in the toilets,” Mr Juma Lubega the councillor of the area said yesterday. Mr Ismail Damba, the lord councillor Lubaga South, called upon residents not to pay taxes until KCCA constructs the Nalukolongo channel and observing collection of garbage every week. “We shall not pay taxes unless the garbage is collected come 1st February, we have discussed in council, resolutions have been done but nothing has been done,” Damba said.